I have mentioned it a lot lately, but it’s definitely burger season in this household. It’s summer, we bought a grill 2-ish months ago, and my husband loves to show off his grilling skillz. Never mind the fact that I have yet to buy him a “Grill Master” apron, even though he begs for it constantly. Speaking of which, does anyone know of stores (online or otherwise) where one could find an affordable, yet cool-looking one? If so, please let me know! 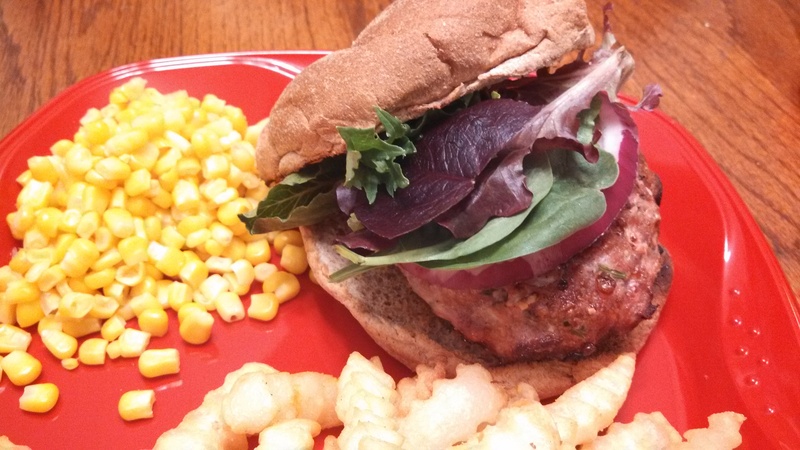 That aside, we made these Blue Cheese Stuffed Burgers from Heather Christo’s blog on Monday and they were delish! I don’t think I used quite as much blue cheese as the recipe calls for…I got one of those small tubs of blue cheese crumbles from the grocery store earlier this week, that I plan to use for another burger recipe this weekend (and yes, turkey – weird, right? haha), so I didn’t want to use it all in one shot. Regardless, it still turned out well. It was a shock in almost every bite – some bites, there was a mouthful of tart blue cheese, and other bites, not. Both my husband and I loved these, and created leftovers for lunch the next day, which is always a bonus! I paired the burgers with store-bought French fries (3 points per serving) and frozen corn. I certainly learned my lesson from my recent “side dish disasters.” I was actually talking to my mom on the phone the other night, as she had read my blog and gave me some suggestions on how to always be prepared for side dishes. I know, I know, store-bought French fries are not legit in the foodie world, but hey, they’re quick and easy! Same with frozen corn (which, I found out recently, sadly has points, because it is a starchy vegetable). -In a large bowl, combine the turkey, parsley, onion, eggs and Worcestershire sauce. -Top the center of each patty with a few blue cheese crumbles and re-shape the patties around the cheese. Cover and refrigerate for at least an hour. -Grill the burgers on medium heat until cooked through, about 6 minutes per side. they also have skinny buns at the store now, too. i saw a cool apron in ferndale for about $20. �i was going to get it for you and then thought you might already have one. Such a beautiful recipe !